You will find the Coupons screen on your WordPress admin area navigating to the GamiPress menu -> Coupons submenu. The coupons screen is a quick view of all coupons stored by GamiPress – Coupons. 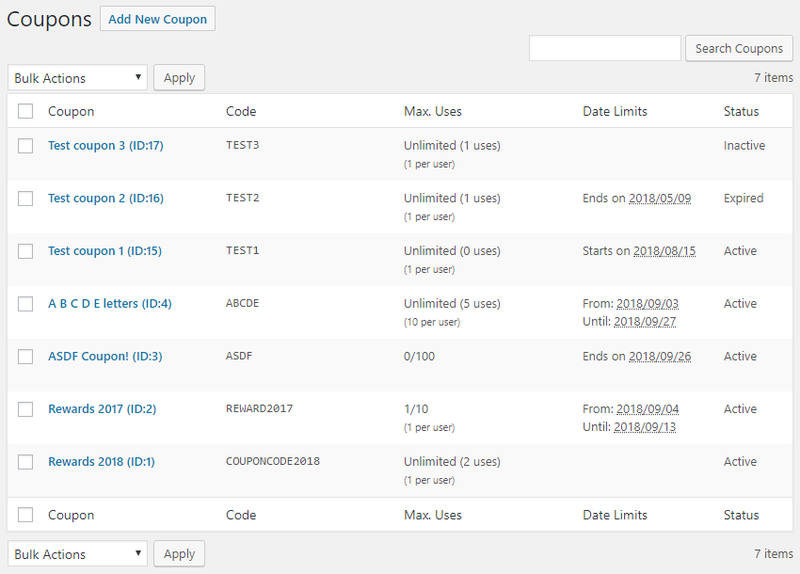 Quickly you will see each coupon, code, maximum uses (total uses and uses per user), date limits (start and/or end date limits) and status. Clicking on the Edit link, you will be redirected to the coupon edit screen. The coupon’s title (used for management at backend). The coupon’s code that users will use on coupon redemption forms to claim it’s rewards. The coupon’s status (active, inactive and expired). The status expired is set automatically when maximum uses has been exceded or coupon has expired by the it’s end date. Note: Just coupons with status active can be redeem. The coupon’s start date. If entered the coupon can be redeemed after or on this date. Leave blank to no limit by this date. The coupon’s end date. If entered the coupon can only be redeemed before or on this date. Leave blank to no limit by this date. Note: After this date, the coupon status will change to expired automatically. The coupon’s maximum number of uses. Set it to 0 for no maximum. The coupon’s maximum number of uses per user. Set it to 0 for no maximum. By default, 1. 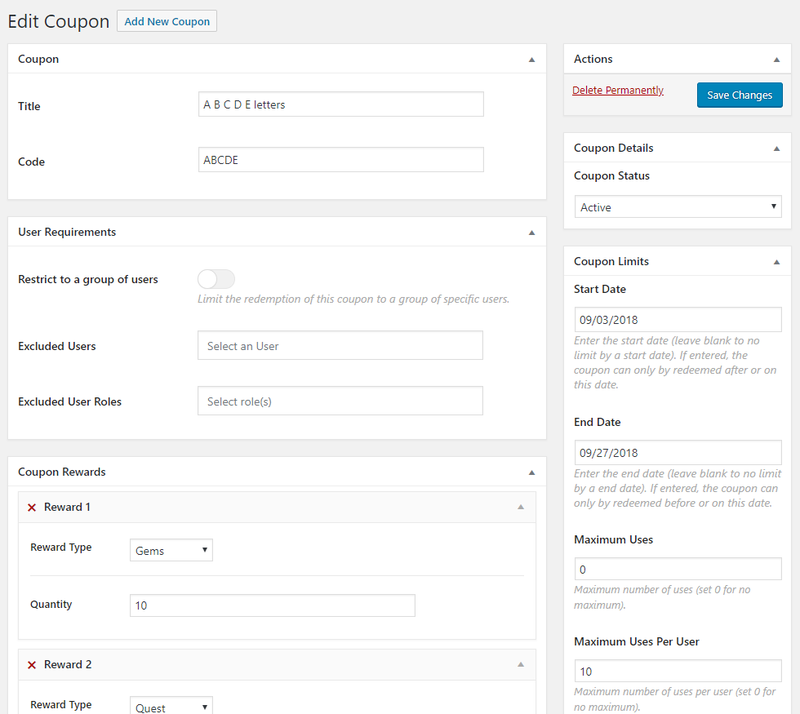 If checked, you can selectively restrict the use of this coupon to a group of specific users or roles. This means just users and roles selected will be able to redeem this coupon. If not checked, you can exclude the users and roles you want. This means users and roles selected won’t be able to redeem this coupon. Users allowed to redeem this coupon. User’s roles allowed to redeem this coupon. Users excluded to redeem this coupon. User’s roles excluded to redeem this coupon. 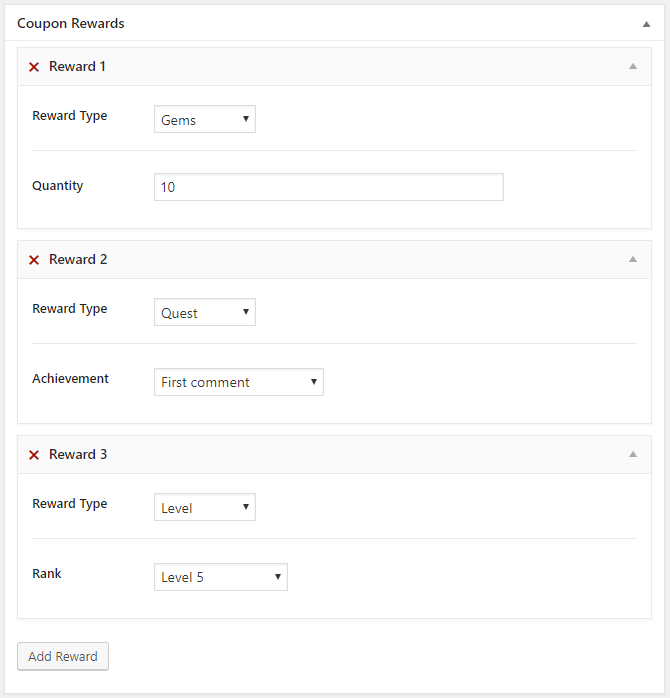 Through the coupon rewards box you can manage all coupon’s rewards you want. Simply add as many rewards you want clicking the button “Add Reward” and delete them through the “X” located at top of each reward. Is the reward type you want to reward (points type, achievement type or rank type). After change this field you will see conditionally new fields. The quantity of points to reward to the user after redeem the coupon code. The achievement to reward to the user after redeem the coupon code. The rank to reward to the user after redeem the coupon code. 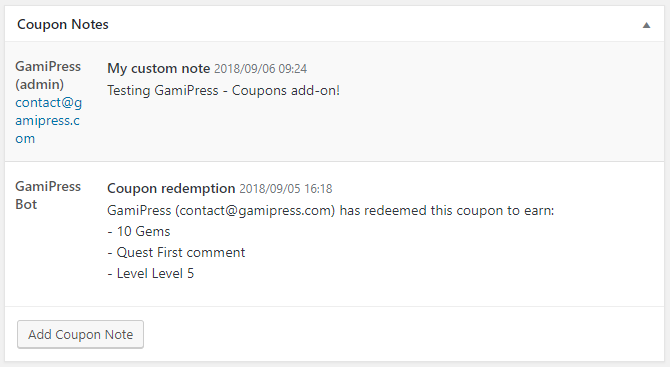 The coupon notes has two functionalities, first GamiPress – Coupons will use it to inform about internal process results like a log when a coupon gets redeemed (The author of this notes will be the GamiPress Bot). 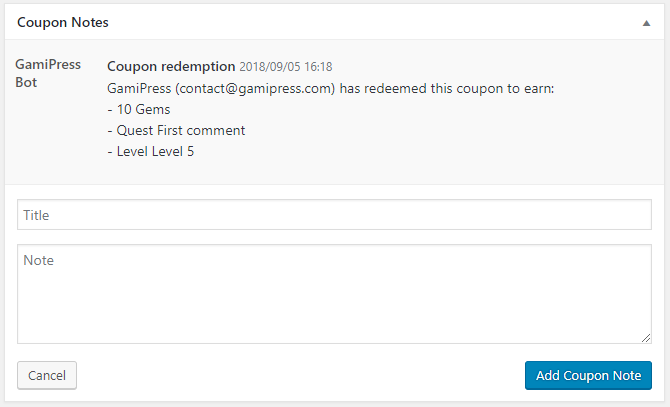 Important: Coupons redemptions will be stored also on GamiPress built-in logs. Just fill the form with the title and note and click to the “Add Coupon Note” button to add it. Note: Adding coupon notes will be done and stored without refresh the page. So you do not need to save the coupon if you just added some coupon notes.